Further more, 'My Weather Indicator' was updated today, the new version brining a new API for the Weather (the Google API is now used instead of the Weather Channel). In my test, there were't many cities available for my country but you can at least see all the available cities in a drop-down and if yours is not available, select one near it. 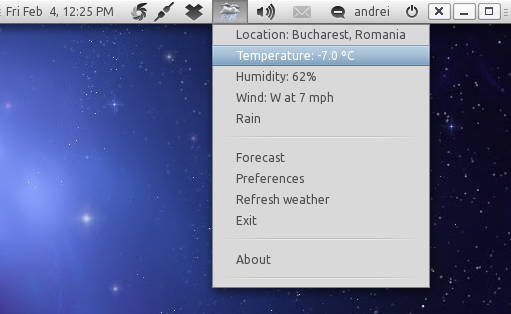 Thanks to the new API, 'My Weather Indicator is a lot faster and there are fewer errors. Other changes include new icons for the weather and new translations: German, Italian, Galician and French. 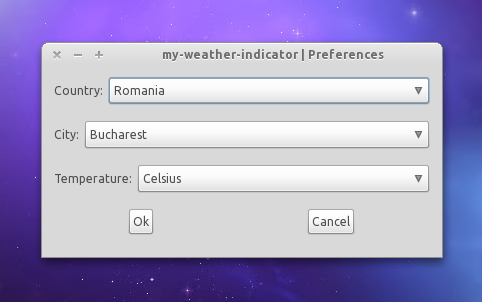 Official 'My Weather Indicator' 0.2.0 announcement (Spanish).